Alan’s amazing method requires Zero Advertising $. 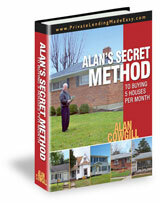 Get all of Alan’s awesome concepts in one 34 page eBook and can’t miss audio, plus get the special bonuses below. BONUS #1: Plus after he shows you all these items listed above, Alan took it a step further and gave you a special question and answer bonus section in the eBook where he answer all his students questions. You don’t want to miss this bonus, so order it today. BONUS #2: Order now and immediately receive the eBook “Insights About Private Lending”. All as an immediate download! No shipping! Start learning right away! If you are interested in finding out how you can start buying 5 houses per month right now, click the BUY NOW button below.